Martial Arts training is more than great exercise, self-defense and fun; Skilled instructors challenge students to overcome personal barriers, and enhance life skills that are requisite to success in our competitive society. This emphasis on personal development, and lack of a "Second String" differentiates Martial Arts training from most sports. Concurrently, becoming accomplished in the Martial Arts is more dependent on the students willingness to persevere and/or familial support rather than athletic ability. Martial Arts students are required to face many exciting, age and skill appropriate challenges, which pay rich dividends for hard work. Martial Arts training by it's nature demands that students become practiced at embracing and growing from challenges as they advance through the ranks. Advancing students can expect improvements in concentration, self-discipline, physical fitness and overall self-confidence, as well as other benefits that are consistent with age. Martial Arts training is not a leisure sports activity, rather it can be best thought of as a challenging educational experience that enhances mental and physical skills. Primary physical skills to be mastered i.e. kicking, hand skills, throwing, joint locks, gymnastic skills.. Language used for instruction i.e. Chinese, Korean, Japanese, English..
Methods of payment i.e. contracts, monthly. When the instructor introduces themselves explain that your interested in learning about the school and the instructor who teaches the class that you and/or your child would attend (note: it's best to speak directly with the instructor of the class your interested in). Don't be discouraged if the instructor is not immediately available due to teaching obligations (the instructors' students should be their first priority), arrange for 5mins or so to talk by phone or in person at a later time. Be sure to take whatever amount of time is necessary to learn about the instructor, as this person will be the most significant determinant of your/your child's experience of the Martial Arts. How long have you been training and when did you start teaching? What do you value most about your personal training? Does your school compete in many tournaments? What value do you see in tournament competition? What kind of techniques are most central to your style and why? What percentage of instruction is in English? How large are the classes that I/my child would attend? Tell me about your fees and methods of payment? How old must you be to start learning? Most schools accept students as young as 4 years. Am I too old to start? Never ! 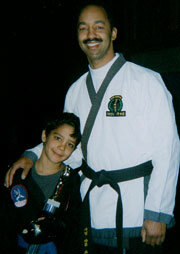 However, some martial arts styles & schools are better suited for older students; talk to the instructor. How can I know if my child will stick with Karate? A child's commitment to learning a martial art may wax and wane, secondarily the parents commitment to their child's learning about perseverance and delayed gratification is paramount to the child's becoming accomplished. How long will it take to become a Black Belt? In most schools students are advised that they will become a Black Belt... Faster by focusing their energy on the content of each class rather than the result. The actual amount of time may vary by as much as 8yrs from school to school, concomitantly the skill of the student at Black Belt may be quite different. Good luck choosing a school! © 1999-2013 All Rights Reserved. Written by Ramon Pruitt.